Dedicated to preserving the legacy of Carson McCullers; nurturing writers and musicians, educating young people; and fostering literary, musical, artistic, and intellectual culture in the United States and abroad. Based on the short story by groundbreaking Southern American writer Carson McCullers at age 19, the film “A Tree. A Rock. A Cloud.” is set at a roadside café in the morning of spring 1947. A boy and man meet by chance. The man relates a luminous tale of personal heartbreak and loss, and of his hard-won understanding of the nature of love. The film also is the directorial debut of award-winning, New York-based actor/director Karen Allen. Executive produced by Columbus State University's Carson McCullers Center. Known for her work as an award-winning actor in more than 40 feature films ("Animal House," "A Small Circle of Friends," "The Wanderers," "Raiders of the Lost Ark," "Starman," "Scrooged," "The Glass Menagerie," "Malcolm X," "The Perfect Storm," "The Sandlot," "Indiana Jones and the Kingdom of the Crystal Skull," "White Irish Drinkers," "Bad Hurt," and the soon to release "Year By the Sea"). She has worked for 30 years on and off Broadway ("A Summer Day," "Speaking in Tongues," "The Glass Menagerie," "The Monday After the Miracle," "Extremities," "As You Like It," "The Country Girl"). Karen began directing theatre at Bard College at Simon’s Rock 10 years ago and continued her work as a director at the Berkshire Theatre Festival in Stockbridge, Massachusetts ("Moonchildren," "Extremities," "Frankie and Johnny in the Clair du Lune") and in New York City with the Obie winning production of Lucy Thurber’s Ashville at the Cherry Lane Theatre. She is a longtime member of the Actor's Studio, on the faculty of the Theatre Dept. at Bard College at Simon's Rock, and on the Board of the Berkshire International Film Festival and the Board of the Amazon Conversation Team. Based on the short story by Carson McCullers, "A Tree. A Rock. A Cloud." is the first film she has written and directed. Jackson Smith (the Boy) resides in Western Massachusetts, not far from where A Tree. A Rock. A Cloud. was filmed. The is his first experience acting in a film. Jackson loves music. He plays the piano and trombone, and spends his time creating short pieces on Garage Band. He is an avid baseball player and fan of the sport. He does parkour, and he is presently performing card tricks for anyone who will be his audience. He studies film with Douglas Trumbull; writing, directing and editing his own home movies. Carson McCullers was born Lula Carson Smith in Columbus, Georgia, on Feb. 19, 1917. Most famous for her novels "The Heart is a Lonely Hunter," "Reflections in a Golden Eye," "The Member of the Wedding," "The Ballad of the Sad Cafe," and "Clock Without Hands." McCullers was also a playwright and a short story writer. Her small but significant body of work includes five novels, two plays, 20 short stories, more than two dozen nonfiction pieces, a book of children's verse, a number of poems, and an unfinished autobiography. McCullers' life was blighted by a series of cerebral strokes caused by a misdiagnosed and untreated childhood case of rheumatic fever. The first stroke occurred when she was only 24 years old, and within several years, she was completely paralyzed on her left side. McCullers suffered a final stroke in August 1967 and died at age 50 on Sept. 29, 1967. Known as one of the most significant American writers of the 20th century, Carson McCullers was a novelist, a short-story writer, playwright, essayist and poet who grew up in Columbus, Georgia. When Oprah Winfrey selected Carson's book The Heart is a Lonely Hunter for her book club in 2004, the 76-year-old book became a No. 1 bestseller that May. Truman Capote, trailblazing writer from the South, author of Breakfast at Tiffany's and In Cold Blood, was a close friend of McCullers. Pulitzer Price-winning playwright Tennessee Williams first connected with Carson by sending her a fan letter after reading The Member of the Wedding. Karen Allen, costar in Raiders of the Lost Ark, debuted her short film adaptation of McCullers's short story "A Tree. A Rock. A Cloud." at Carson's 100th Birthday Celebration. The Carson McCullers Center for Writers and Musicians is dedicated to preserving the legacy of Carson McCullers; to nurturing writers and musicians and educating young people; and to fostering literary, musical, artistic, and intellectual culture in the United States and abroad. To that end, the Center operates a museum-artist residency space in McCullers's childhood home in Columbus, Georgia, and an events space in her adult home in Nyack, New York; offers fellowships for writers, artists, musicians, and scholars; presents educational and cultural programs in both Columbus and Nyack; and maintains an ever-growing archive of materials related to the life and work of Carson McCullers. CSU maintains an extensive archive of McCullers material on campus in the CSU Archives. Many of McCullers' papers are housed in The Harry Ransom Center at the University of Texas in Austin. The Carson McCullers Center is part of The Southern Literary Trail. The Carson McCullers Center has received generous grants from the Historic Chattahoochee Commission. The Carson McCullers Center has received generous grants from the Georgia Humanities Council. Carson McCullers is featured in the New Georgia Encyclopedia. The Carson McCullers Center is part of the local area organization Chattahoochee Valley Writers Inc. The Carson McCullers Center has been featured in The Georgia Review. The Carson McCullers Center is a proud member of the Columbus Cultural Arts Alliance. In 1944 when Carson's father died, her mother left Columbus and moved to Nyack, New York, where she bought this house. Carson lived with her mother and sister off and on in this house for years. Carson eventually bought the house from her mother and is where she died in 1967. In December 2006, the McCullers house in Nyack was added to the National Register of Historic Places. Carson's physician and long time friend, Dr. Mary E. Mercer, bequeathed the home in Nyack to Columbus State University's Carson McCullers Center. After Mercer's passing in late April 2013, the Center inherited not only the house but also many Carson-related artifacts and documents that shed light on the last 10 years of Carson's life. Due to the generosity of Mercer, CSU is one of the only universities to own two homes by a single author and now houses the world's most extensive research collection on Carson. An endowment in Mercer's name also has been created to continue these efforts in the curation and preservation of Carson's legacy. The center accepts applications for the 2019 Fellowship on Feb. 1, 2019. Deadline for submissions is April 1, 2019. Named in honor of Carson's parents, The Marguerite and Lamar Smith Fellowship for Writers was inspired by McCullers's experience at the Breadloaf Writer's Conference in Vermont, especially the Yaddo Arts Colony in Saratoga Springs, New York. To honor the contribution of these writers' residences to McCullers's work, the Carson McCullers Center for Writers and Musicians awards fellowships for writers to study in her childhood home in Columbus, Georgia. The fellowships are intended to afford the writers in residence uninterrupted time to focus on their work, free from the distractions of daily life and other professional responsibilities. The Marguerite and Lamar Fellowship for Writers is offered during fall semester. The fellowship begins the first of September and ends the first of December. During this time, the writing fellow will reside in a spacious private apartment inside Carson McCullers's childhood home, the Smith-McCullers House. The fellow is provided with a stipend of $5,000 to cover costs of transportation, food and other incidentals. Fellowship recipients are encouraged to take an active role in the community and to meet informally with students and local residents interested in writing. The fellow will work with the McCullers Center director to plan a presentation near the end of the residency. The Smith-McCullers House is located on a quiet residential street in Columbus' historic area. The fellow will occupy one-half of the Smith-McCullers House. The remainder of the house serves as the Smith-McCullers house museum. Because the house operates as a museum and outreach center, events and tours frequently occur in the upper part of the home during the fellow's time here. However, the apartment is comprised of a large living/writing/sleeping space, a private bathroom, and a private entrance, allowing fellows to work without interruption or disturbance by the Center and Museum. The kitchen is shared by the fellow and the Center. The Center uses the kitchen for special events throughout the fall, in which the fellow is always invited to participate. The apartment is adequately furnished. Fellows need bring only their personal belongings. The Carson McCullers Center provides utilities, general property maintenance, a computer and online service. Fellows are encouraged to bring a laptop. Since public transportation is limited, an automobile is recommended; however, there are grocery stores, post offices, and other services within walking distance. A spouse or companion is welcome, but children and pets are not allowed. We will begin accepting submissions Feb. 1, 2019. Application deadline is on or before April 1, 2019. To submit your applications and recommendation letters, please send them to mccfellowship@columbusstate.edu. II. Also, we require at least two letters of recommendation. All applications must be completed on or before April 1. All applications will be acknowledged, and finalists will be chosen and scheduled for telephone interviews with the selection committee by May 15. After each finalist completes a telephone interview, a Fellow will be chosen by the selection committee, to be announced June 1. Announcement of Winner: June 1. All applicants will receive notification of the winner. Founded in April 2012, this scholarship honors the memory of former CSU English Department faculty member, Virginia Spencer Carr, and her valuable contributions to studies of Columbus author Carson McCuller in the biography "The Lonely Hunter." Created in honor of Columbus resident Susan M. Cochran and her dedication to study of the great American author William Faulkner, the Scholarship for Faulkner Studies provides funding for gifted students majoring in English at Columbus State University to pursue their education in literary studies. Columbus State University's Department of English and Carson McCullers Center for Writers and Musicians proudly present The Carson McCullers Literary Awards. The Carson McCullers Literary Awards offers prizes for high school students in fiction, poetry, creative nonfiction, expository essay, playwriting and screenwriting, with $300 for first place in each of those categories, $200 for second place, $100 for third place. A separate contest will award prizes exclusively for CSU students, with the same prizes being offered in each category. The prizes will be formally awarded at the Carson McCullers Literary Awards Ceremony at 6 pm on April 24, 2019, in the Arnold Hall Atrium on CSU’s Main Campus. The awards ceremony—a celebration of creative writing by area high school students and students from CSU—will offer winning students a chance to be publicly recognized as they accept their award certificate and prize money. Light refreshments will be served at the event. Please call 706-565-1200, Monday to Friday. If your call goes into voicemail, please leave your name and contact information, the date and time you would like to tour the house, and please give at least 24-48 hours advance notice. Your call will be returned, as soon as possible, during regular business hours Monday to Friday, 8 AM to 5 PM (excluding holidays). The Carson McCullers Center for Writers and Musicians happily announced in May that the award-winning novelist, short story - and essay-writer Melissa Pritchard won the 11th annual Marguerite and Lamar Smith Fellowship for Writers. As the fellowship recipient, Pritchard will live and work in the Smith-McCullers House in Columbus from September to December 2016. Melissa Pritchard is the author of eight books of fiction, a biography and a book of essays. Her works have been awarded numerous honors, including the Flannery O'Connor Award, the Carl Sandburg Literary Award, and the New York Times Editor's Choice and Notable Book of the Year award. She has also been awarded fellowships and grants from the National Endowment for the Arts, Brown University's Howard Foundation, and the Bogliasco Foundation, she has been published in over seventy journals, including The Paris Review, The Southern Review, O, the Oprah Magazine, The Nation, the New York Times and Chicago Tribune. A Katherine Schneider Journalism Award finalist, her work was recognized by Atlantic Monthly's 2013 Best of Journalism Awards. Additionally, her stories have been performed by World Theatre actors in New York City and Los Angeles. Pritchard, Professor Emeritus at Arizona State University since 2016, was honored with the Founders' Day Teaching Award and a Faculty Achievement Award. As a journalist, she has traveled to India, Afghanistan, Ecuador and Ethiopia, and in 2009, established the Ashton Goodman Grant, working with the Afghan Women's Writing Project to provide funding for the education and literacy of Afghan women and girls. She currently lives in Phoenix with her short-legged muse, a miniature dachshund named Simon. While at the Smith-McCullers home this fall, Pritchard will be working on a draft of her latest novel. Virginia Spencer Carr, a professor of English at Columbus College (Columbus State University) from 1969-1985, is best known for the detailed biography The Lonely Hunter, about the life of famed Columbus writer, Carson McCullers. Dr. Carr's interest in Carson McCullers bloomed early in her studies, when she was teaching in Savannah in the early 1960s and a student asked to write a paper about McCullers. After writing her dissertation on McCullers at Florida State University, Dr. Carr came to Columbus College as a faculty member and began her extensive research and writing on the McCullers biography, which was published in 1975. After leaving Columbus College in 1985, Dr. Carr served as a Professor of English at Georgia State University and went on to write biographies on writers John Dos Passos and Paul Bowles. She also wrote extensively on Katharine Anne Porter and Tennessee Williams. 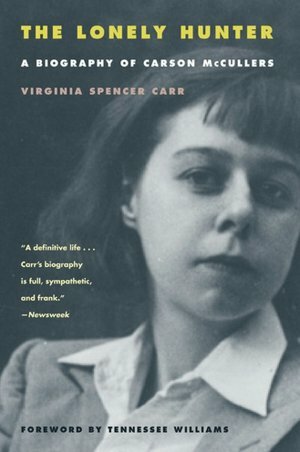 Virginia Spencer Carr's dedication to studies of Carson McCullers is truly invaluable, and The Lonely Hunter is easily considered the most significant biographical work on McCullers. Founded in April 2012, this scholarship honors the memory of former CSU English Department faculty member, Virginia Spencer Carr, and her valuable contributions to studies of Columbus author, Carson McCullers, in the biography The Lonely Hunter. An incredibly well-researched and comprehensive work, The Lonely Hunter charts the course of Carson's life here in Columbus and follows Carson on her journey to New York to become a successful, world-renowned author. As Dr. Carr's work shows in such detail, Carson immersed herself in the artistic communities of her hometown and her adopted home in New York City. Therefore, it is fitting that the scholarship in Dr. Carr's name supports students studying in New York, following in both Carson's footsteps and in Dr. Carr's work on Carson. The scholarship benefits English majors who participate in CSU's New York Arts Program, which takes students to study in New York City for three weeks to one month each May/June. The Susan M. Cochran Memorial Endowment for Faulkner Studies provides funding for gifted students majoring in English at Columbus State University to pursue their education in literary studies, to spend one semester of intense, one-on- one directed study of Faulkner with a CSU faculty member, and to travel one summer during their undergraduate career to attend the University of Mississippi’s annual Faulkner and Yoknapatawpha Conference in Oxford. The sources of creation are very mysterious, and I don't think one can find them by just looking for them. I think they have to come from within you. Don't you feel so? For questions concerning copyright and permissions to use the works of Carson McCullers, please contact Andrew Nurnberg Associates at www.andrewnurnberg.com.